The early eighteenth century was one of the best ages for satire. Writers such as Joseph Addison (1672-1719) and Richard Steele (1672-1729) wrote their Spectator and Tatler magazines to expose the follies and vices of polite society, whilst people such as Alexander Pope (1688-1714) wrote The Dunciad in 1728. A favourite subject among the satirists was the mocking of political figures (not even the King was sacrosanct), and one of their favourite targets was Britain’s first Prime Minister, Sir Robert Walpole (1676-1745). To the Glory of the Right Honourable Robert Walpole-a Satire on ‘Robinocracy’ (c.1730). In the eighteenth century, the King chose which party would form the next ministry, and also chose the Prime Minister. George II chose the Whigs under the leadership of Walpole. Between 1721 and 1742 Walpole, as Prime Minister [well, officially Walpole was First Lord of the Treasury as in the 1700s the term ‘Prime Minister’ was a derogatory term], extended his grip over his own MPs, and entrenched his position as Prime Minister under the King. During his time in office many charges of corruption were leveled at him by his Tory opponents, notably during the South Sea Bubble – a major financial crash from which many MPs profited. Those same MPs were protected by Walpole when Parliament launched an enquiry into the matter. Robert Walpole, Prime Minister between 1721 and 1742. [Source: Wikipedia]. Walpole was often compared to a thief. In the 1728 ballad opera, The Beggar’s Opera, Walpole was compared to the Thief Taker, Jonathan Wild, and would be again in 1743 in Henry Fielding’s novel, The Life of Jonathan Wild the Great. It should be no surprise, then, that he was on occasion equated with England’s most famous thief, Robin Hood. A nickname for Walpole’s regime was ‘Robinocracy’ or ‘Robin’s Reign’, and in 1727 a satirical ballad appeared entitled Robin Hood and the Duke of Lancaster. Keeps us all but himself, my good liege, in a wood. And never calls me to partake of the cheer. For instead of a St. he would bring in a sinner. The King, however, is unimpressed. These charges are hardly “revelations” to him. He’s fully aware of Robin Hood’s corrupt ways; yet what is he to do? And made a low ‘beisance as if who should say. The King has placed Robin Hood in charge, quite simply, for want of anyone better. This is exactly how the situation was with George II in 1727. The ballad was written for a politically informed urban audience. It was at the more expensive end of the range of ballads which were available, costing 4d. (ballads often cost 1d. at most). 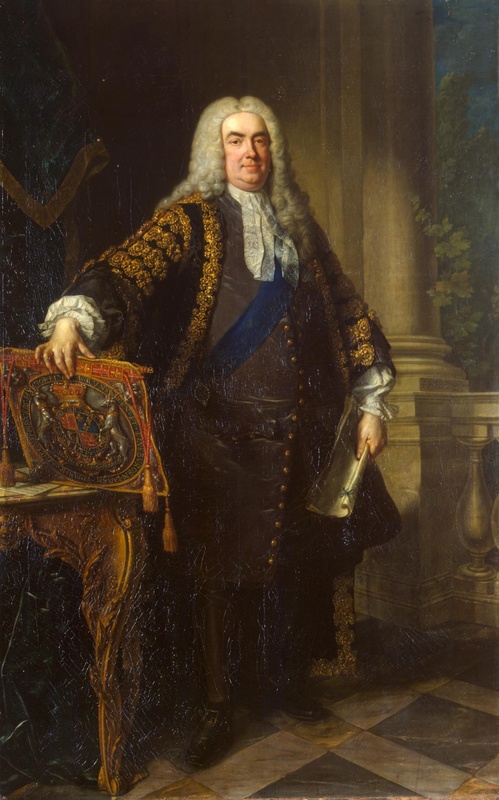 The subject matter refers to the time that Lord Nicholas Lechmere (1675-1727), Chancellor of the Duchy of Lancaster, heard a rumour that Walpole had invited the disgraced Tory Jacobite supporter, Lord Bolingbroke, back to England (he had been exiled to France) to serve in Parliament. The King was fully aware of what was going on, and when Lechmere burst into the King’s presence, he was embarrassed by the King’s dismissal of his concerns as mere ‘bagatelles’. The King, by way of a joke, then offered the Premiership to Lechmere, who of course refused it. In any case, Lechmere did not live long enough to be too embarrassed about this affair as he died of apoplexy in the same year. Most scholars are quite dismissive of this ballad, saying that it does nothing to add to the overall legend of Robin Hood because it is a clear product of the eighteenth century. In the second respect they are correct; the events clearly relate to Walpole, George II, and Lechmere. But I think it does add to the legend: it shows, as I am arguing in one section of my thesis, that Robin Hood was not always viewed as a hero even in comparatively modern times. In the eighteenth century Robin Hood was both a villain and a hero, and in my opinion, it shows a continuity with some medieval sources which described Robin Hood in a negative light. Such a portrayal of Robin Hood would have been unthinkable in the nineteenth century, as after Ivanhoe by Sir Walter Scott, Robin of Locksley was transformed into an honest, caring, gallant, and heroic Saxon freedom fighter.